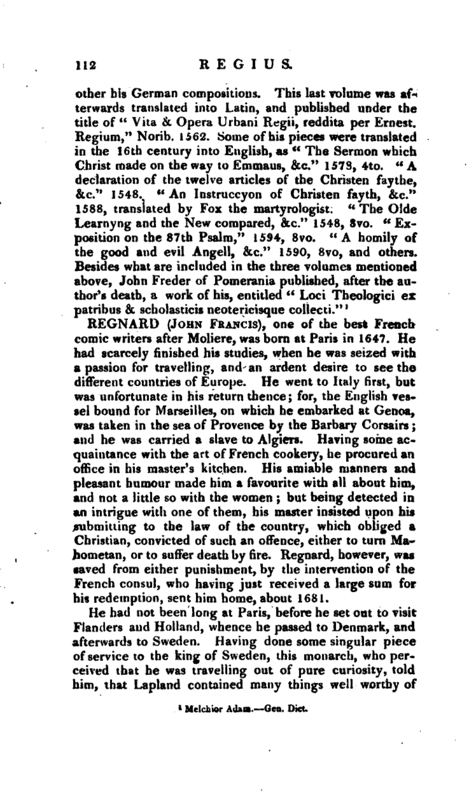 , or Le Roi, a name he thought proper to change, as it was liable to be applied in ridicule, was a learned Reformer of the 16th century, and born at Langenargen, or Arga Longa, in the territories of the counts of Mountfort. 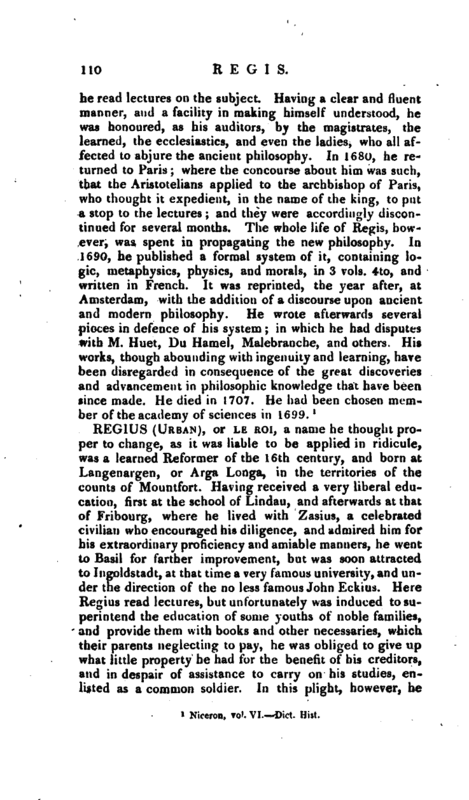 Having received a very liberal education, first at the school of Lindau, and afterwards at that of Fribourg, where he lived with Zasius, a celebrated civilian who encouraged his diligence, and admired him for his extraordinary proficiency and amiable manners, he went to Basil for farther improvement, but was soon attracted to Ingoldstadt, at that time a very famous university, and under the direction of the no less famous John Eckius. Here Regius read lectures, but unfortunately was induced to superintend the education of some youths of noble families, and provide them with books and other necessaries, which their parents neglecting to pay, he was obliged to give up what little property he had for the benefit of his creditors, and in despair of assistance to carry on his studies, enlisted as a common soldier. In this plight, however, he | happened to be discovered by Eckius, who procured his discharge, and prevailed on the parents of his pupils to discharge all arrears due to him. Urban then returned to his studies, and became so distinguished, that the emperor Maximilian, passing through Ingoldstadt, made him his poet-laureat and orator; and he was afterwards made professor of poetry and oratory in that university. 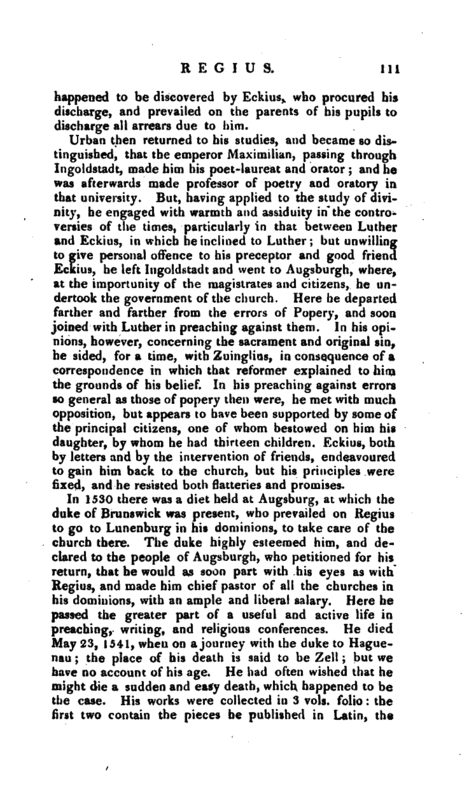 But, having applied to the study of divinity, he engaged with warmth and assiduity in the controversies of the times, particularly in that between Luther and Eckius, in which he inclined to Luther; but unwilling to give personal offence to his preceptor and good friend Eckius, he left Ingoldstadt and went to Augsburgh, where, at the importunity of the magistrates and citizens, he undertook the government of the church. Here he departed farther and farther from the errors of Popery, and soon joined with Luther in preaching against them. In his opinions, however, concerning the sacrament and original sin, he sided, fora time, with Zuinglius, -in consequence of a correspondence in which that reformer explained to him the grounds of his belief. In his preaching against errors so general as those of popery then were, he met with much opposition, but appears to have been supported by some of the principal citizens, one of whom bestowed on him his daughter, by whom he had thirteen children. Eckius, both by letters and by the intervention of friends, endeavoured to gain him back to the church, but his principles were fixed, and he resisted both flatteries and promises.